I had to change the inks for this printer and bought the HP 363 cartridges but the previouse ink number was 177. It keeps coming up with the message that it's the wrong ink. I don't know what to do. Are they still available? I would appricate your help? Many thanks. The HP 177 ink cartridges are cartridges from a different zone / region. This suggests that your printer was not bought in the UK and explains why the HP 363 ink cartridges you've purchased will not work in your printer. We can only supply ink cartridges for use in UK printer models. Please contact HP directly as they may be able to advise you of a local supplier of the HP 177 ink cartridges that are required for your printer. Alternatively, they may be able to chnage the region code on your Photosmart D7263 printer so that it can accept UK cartridges such as the HP 363 ink cartridges. For crisp, crystal clear prints it is hard to beat the HP D7263. Eventually your HP D7263 will use all of your printer ink, and when it happens you'll soon come to realise that purchasing HP D7263 ink may be quite costly. Thankfully, however, you have no need to bother about paying the high costs you'll see on the main street because now at Cartridge Save you can find all the HP D 7263 cartridges you'll ever need at ultra competitive prices. Start to save money on your ink by ordering online at Cartridge Save! Don't pay high prices on a D-7263 original cartridge or D7263 compatible ink in the main street when it's easy to save a bundle of money ordering online with Cartridge Save. You get one hundred per cent peace of mind when purchasing PhotoSmart D7263 ink cartridges from us seeing as every one is guaranteed by a no quibbles money back guarantee. Keep in mind that every single order also has free delivery, mostly delivered to your doorstep on the next working day! The HP Photosmart D7263 lets users get the most value for their money with a user-friendly interface and intelligent features. However, it is plagued by compatibility issues with Windows 7 and newer operating systems. It's very hard to get support once the warranty expires. Like its predecessors, the HP Photosmart D7263 features an uncluttered control panel and a standard paper tray unique to HP printers. Most controls are accessible via the touch-screen LCD display, so the printer is more user-friendly. The HP Photosmart D7263 supports Ethernet and USB 2.0, as well as with direct printing via memory card slots and a PictBridge port. The printer is approximately 8 kg, uses the 6-ink Vivera system for more vivid prints, and has a duty cycle of 3,000 pages. The print resolution of the HP Photosmart D7263 can be enhanced to 4800x1200 dpi for more colourful and vibrant printouts. Photo printing speed has improved. Colour printout rate is 31 ppm, while black printout rate is 32 ppm. You can print directly from any compatible digital camera using the PictBridge port, or load files directly into the printer from a TransFlash MicroSD Card, xD-Picture Card, Memory Sticks, Secure Digital, and CompactFlash/Microdrive. It can be difficult to hook a computer, an HP camera, or a laptop to the HP Photosmart D7263 because the main USB port is at the rear. Bluetooth printing is optional, which means you need to buy an adapter for it. The input paper tray is poorly designed and capable of handling up to a hundred sheets of plain paper. 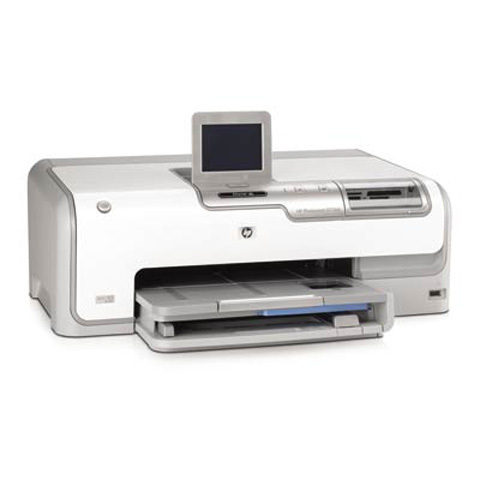 The HP Photosmart D7263 great for printing photos, but when it comes to documents, its performance is average.